Just a few minutes ago, I learned of the untimely death of legendary infomercial pitchman Billy Mays at age 50. (Details here.) With his trademark dark beard, blue shirts, and booming voice, Mays appeared on TV pitching hundreds of products of all sorts, everything from bug repellents to stain removers to health insurance. People throw around the words “icon” and “unique” a lot, but Billy Mays was one person who truly deserved those labels. Recently people got to know the man more intimately on the reality TV show Pitchmen, which took viewers behind the scenes of the business run by Mays and his partner Anthony “Sully” Sullivan. Unlike the cases of some of the other celebrities who have passed away recently (Michael Jackson, Farah Fawcett, Ed McMahon), Billy Mays’ tragic death occured at the very height of his fame and popularity. I’m very sad to see him go. Is AJ Khubani Trying to Become the Next Billy Mays? I heared that Billy Mays challenged Vince Offer to a duel earlier this year. Perhaps he shouldn’t have done that. Rest in peace Billy. So sad, Pitchmen showed that he seemed to be a really nice guy. I feel so bad for his wife and family. My friends are teasing me for being upset about Billy Mays’s death, but it’s really upsetting to me for some reason. Maybe it’s because both of my parents are older than he was or maybe it’s that Natasha Richardson and I have the same birthday, but hearing about another death was heartbreaking. Is so tragic… And what’s even more tragic is that meanwhile Kevin Trudeau and Klee Irwin are still alive. NOT FAIR!!! 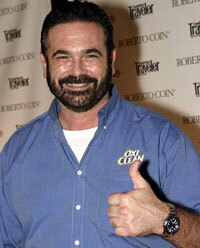 Billy Mays is someone, whom I’ve seen on TV for the last 5 years, and then today, he is gone. He feels like one of the people I knew personally. I’ve seen people, who used to come regularly to a particular chat room (in my case, Books & Literature chatrooms in Yahoo), suddenly taken away by death in more than one occassion. Damn shame, he was a fine man though he was a bit annoying at times with his commercials, but he had some damn good commercials. I think we’ll miss his eternal optimism that with this or that doodad, one’s life will be perfect. He was also a big enough man to be directed by his son. His infomercials are still playing Im watching the one for the dual saw now, kinda freaky and very sad. Perhaps the most jarring moment regarding Billy Mays’ death, was, for me: when the news on TV reported his death, then went to commercial. I honest to god almost wept. RIP Billy, you were one in a million. Seriously…I couldn’t believe the news when I heard it. What a week – first MJ and then Billy Mays. I sucked it up and bought a RIP Billy Mays t-shirt from billymaysshirt.com. Don’t mean to spam, but I figured the masses need one. Billy might have been loud and a little obnoxious sounding sometimes, but his enthusiasm for whatever he was selling was infectious. That’s a great pitchman. If he was around 100 years ago he could have been a traveling salesman selling miracle creams and what not. Mays was born to pitch. RIP.